Cord blood is contained in the umbilical cord and placenta of a newborn child. It can be easily collected and frozen for later use. Cord blood contains blood (haematopoietic) stem cells, which can produce all the other cells found in blood, including cells of the immune system. Transplants of haematopoietic stem cells (HSCs) from cord blood can be used to treat several different blood diseases, such as leukaemia. Compared to HSCs from bone marrow donors, transplants of HSCs from cord blood appear to lead to fewer immune system incompatibilities, such as graft-versus-host disease. However, cord blood transplants also have limitations. Treatment of adults with cord blood typically requires two units of cord blood to treat one adult. Clinical trials using "double cord blood transplantation" for adults have demonstrated outcomes similar to use of other sources of HSCs, such as bone marrow or mobilized peripheral blood. Current studies are being done to expand a single cord blood unit for use in adults. Cord blood can also only be used to treat blood diseases. No therapies for non-blood-related diseases have yet been developed using HSCs from either cord blood or adult bone marrow. As the research into umbilical cord blood and it’s therapeutic use for blood diseases has grown, so has the question as to whether people should privately store the cord blood of their offspring for future use. A recent paper on this issue by Mahendra Rao and colleagues advocates the practice of cord blood banking (for treatment of blood diseases) but in the context of public cord blood banks rather than a private cord blood banks. Any adult needing treated would need at least two cord blood samples that are immune compatible. So one sample will not be sufficient. A child might only need one cord blood sample but in the case of childhood leukaemia there is a risk that pre-leukemic cells are present in cord blood sample - and so the child could not use their own cells for therapy. If everyone donated cord blood to public registries for the 'common good' this would increase the chances of someone benefiting from a double cord blood transplant. This far outweights the actual probability of the person who donated the sample being able to usefully use it for themself. “This reanalysis supports several previously expressed opinions that autologous [to use one's OWN cells] banking of cord blood privately as a biological insurance for the treatment of life-threatening diseases in children and young adults is not clinically justified because the chances of ever using it are remote. The absence of published peer-reviewed evidence raises the serious ethical concern of a failure to inform prospective parents about the lack of future benefit for autologous cord banking … Attempts to justify this [commercial cord blood banking] are based on the success of unrelated public domain cord banking and allogeneic [using someone ELSE'S cells] cord blood transplantation, and not on the use of autologous [the person’s OWN cells] cord transplantation, the efficacy of which remains unproven”. Cord blood in public banks is available to unrelated patients who need haematopoietic stem cell transplants. Some banks, such as the NHS bank in the UK, also collect and store umbilical cord blood from children born into families affected by or at risk of a disease for which haematopoietic stem cell transplants may be necessary - either for the child, a sibling or a family member. It is also possible to pay to store cord blood in a private bank for use by your own family only. Cord blood can be stored in public or private (commercial) cord blood banks. Companies throughout Europe also offer commercial (private) banking of umbilical cord blood. A baby's cord blood is stored in case they or a family member develop a condition that could be treated by a cord blood transplant. Typically, companies charge an upfront collection fee plus an annual storage fee. Umbilical cord blood contains haematopoietic (blood) stem cells. These cells are able to make the different types of cell in the blood - red blood cells, white blood cells and platelets. Haematopoietic stem cells, purified from bone marrow or blood, have long been used in stem cell treatments for leukaemia, blood and bone marrow disorders, cancer (when chemotherapy is used) and immune deficiencies. This factsheet was created by Rajeev Gupta and reviewed by Tariq Enver, with additional advice from Alexander Medvinsky. Reviewed in 2016 by Dan S Kaufman. Edited by Emma Kemp and Jan Barfoot. 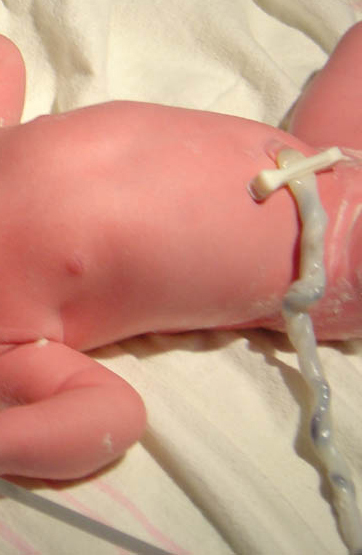 Lead image of baby's umbilical cord from Wikimedia Commons. Possible human blood stem cell image by Rajeev Gupta and George Chennell. Remaining images of blood sample bags and red blood cells from Wellcome Images. There are over 130 public cord blood banks in 35 countries; They are regulated by governments and adhere to internationally agreed safety, quality and ethical standards. Over the last 20 years more than 20,000 patients worldwide have had umbilical cord blood transplants. This is the nearest scientists have come to identifying a human blood stem cell. This cell has certain characteristics that suggest it may be a blood stem cell. A number of blood disorders are already treated using cord blood.